Attracted to black light. This is another one of the mystery Blepharomastix moths discussed previously here. Perhaps an ID can eventually be provided. Well, now we know it isn't a fluke! Three of them exactly alike! Did you catch it? Poor thing - I preserved the body in USP ethanol because I know that this allows DNA-barcoding if desired (I am not sure about genital analysis). The previous moth escaped (I'm clumsy) and this one almost did. 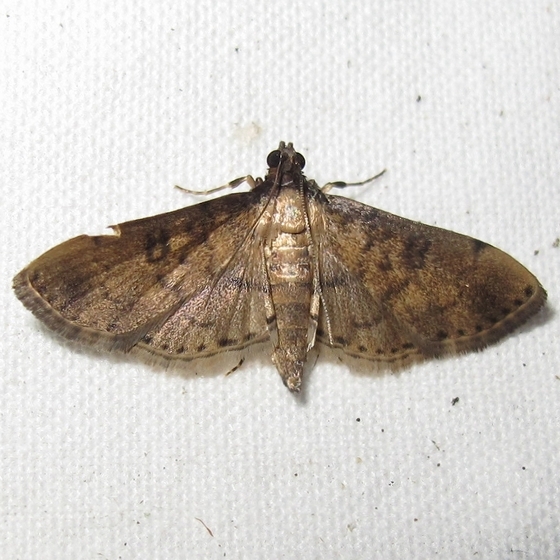 Heppner's Florida checklist includes two Blepharomastix species that are not in BG nor in MPG. Maybe I have to check with Jim Hayden at the Univ. of Florida. Great! That sounds like the best bet. You could ask about keeping a leg to send to BOLD, but they do not always separate difficult species.